Here at Liquid Fireworks we specialise in installing self-standing water attractions. We have been running as a family company for three generations and have gained international recognition as the world’s foremost leaders in water, light and music productions. In the 1920’s, Otto Przystawik conceived the first ever dancing fountains; from this point, he started creating fountains on a small scale for display in restaurants and stores. 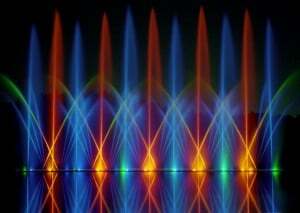 Now, we have become the biggest musical fountain company in the world. We have been creating and installing customisable self-standing water attractions across the world for more than 70 years, being featured in many major venues such as Disney World, SeaWorld and the Universal Studios. Our self-standing water attractions are perfect for bringing attention to your facility! We have self-standing attractions that run all year round, with one particularly stunning example bringing in 100 coaches per week that stop in to see this show during the season. Running 50 weeks per year, the owner reports that not a single show has been lost due to equipment failure in nine seasons at over 3,000 shows. Liquid Fireworks provide an awe-inspiring dancing fountain that commands attention, allowing a venue to provide continual shows indoors with little maintenance. Dancing fountains have all the magic and beauty of a firework show indoors, and an indoor music fountain can enhance a whole manner of venues. These shows can be enjoyed whatever the time of day or weather conditions may be, with Liquid Fireworks outdoor shows being installed worldwide in public parks, hotels, shopping centers, theme parks and residential sites. Liquid Fireworks are more than happy to help any clients looking to book a self-standing water attraction. Simply call us on (239) 574-5181 or email at sales@liquidfireworks.com to speak to a member of our experienced team.